Want to design your own custom phone booth booth? Fill out the form and our creative design team will provide a digital proof and custom quote for free. Cubicall walls and table can be finished in almost any color or finish. Acoustic panels, seat and carpet are available in a variety of colors. 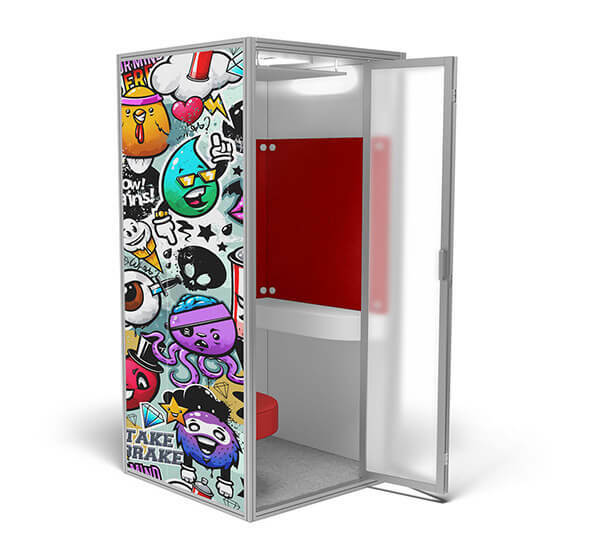 Cubicall booths can even be designed with custom graphics. The sky's the limit! Cubicall color options are covered in the cost of the booth. There are additional costs for premium finishes (e.g. wood) and custom graphics. Not sure where to begin? Download our catalog for sample swatches. Pantone, RGB, Hex, CMYK value will help! Upload your logo or custom graphic. 5MB limit. Vector file types are preferred. Acceptable formats are .eps, .ai, .pdf, .png, .jpg. If you have a specific execution in mind, please include it in your notes.